Everyone has the right to breathe clean air. But that right is being denied to the millions who live in the shadows of nearly 150 oil refineries across the United States. Modern pollution control technology exists and is widely available. Earthjustice is working to get oil refineries to clean up their pollution. We are also fighting EPA's delay of chemical disaster prevention measures that would protect children, workers and communities at risk from chemical accidents. 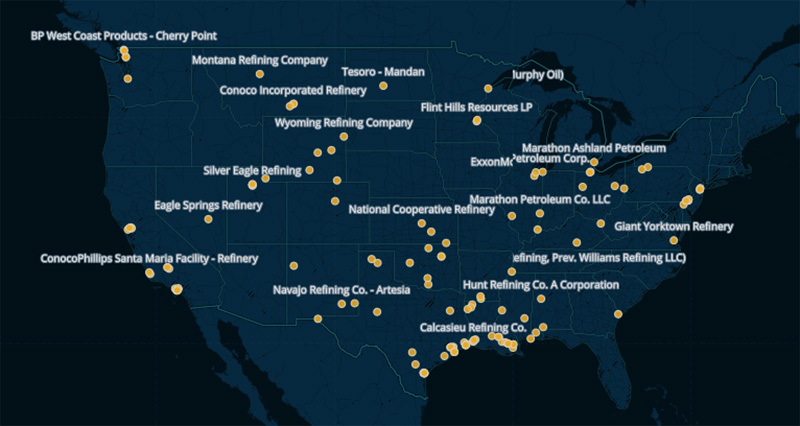 These are the 147 refineries. Click on each to view details of each refinery. Use the icon (on the left) to search for a location on the map. Population Data: Based upon EPA Enforcement & Compliance History Online (ECHO), and the 2010 U.S. Census and American Community Survey. ICR Emissions: Information Collection Requests were sent by the EPA to all oil refineries in 2011. They provided EPA with self reported data on emission inventories, processing characteristics and other information for each refinery. This data is being used to set health and safety standards that protect communities from toxic air pollution. TRI Emissions: Toxic Release Inventory is required reporting by the EPA to track toxic chemicals that pose a threat to human health. All refineries are required to report annually, but the TRI is less comprehensive than the ICR, covering fewer pollutants. Where ICR data was not provided by a refinery, TRI reporting from 2011 is displayed.